They say you only get one chance to make a first impression. Unfortunately, most of my first impression of Firehouse Theater Project in its production of Death of a Salesman was pretty negative. First, they could not find my reservation at Will Call. Fortunately they found me a seat in an almost sellout crowd (and fortunately my guest was running late because there was only one seat). Unfortunately the ushering staff was not very helpful in finding that seat. One walked away from me and the other stood and stared. When I took a program from his basket and asked for help finding my seat, he pointed at the aisle and said to count “x number of rows” and find it! Also, unfortunately, my seat was against a wall near the top and behind 3 rather large floor to ceiling columns that partially blocked my view of many scenes. Also, the temperature of the theater was well above 80 degrees. But while my first impressions of the theater were negative, my impression of the show and the actors were positive from the first entrance to the last blackout. 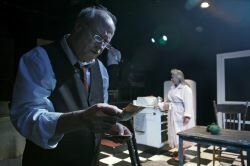 From the moment Joe Inscoe (Willie Loman) walked on stage, you felt a tired, withering man who carrying the weight of the world on his shoulders. Inscoe’s stage presence maintained your interest through every moment of the play. He touched every nuance of this characters life and soul with his body, face and voice — even creating little mannerisms that made the character so life-like. Inscoe was very believable as the aging salesman who just wants to be liked and just wants his life to have had some lasting meaning. 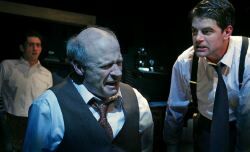 In many ways, his performance of Loman were one part Archie Bunker, one part Peter Boyle (from “Everybody Loves Raymond”) and one part my own grandfather. He was the every man, who life has hardened on the outside but maintains a heart of gold and love of family on the inside. He was especially poignant in juxtaposing Willie’s dual worlds — the present and the past that Willie was reliving as he grasped to maintain his grip on reality. 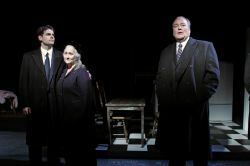 Jacqueline Jones (Linda Loman) was equally true to life as Willie’s long-suffering wife. She was Loman’s Edith Bunker to his Archie in her warmth, character and likeability, with a double helping of down to earth intelligence and strength (no dingbat there). Matt Bloch (Happy) and Adrian Rieder (Biff) performed at the same professional level as their stage parents. 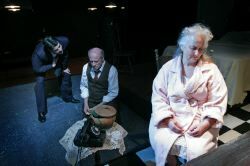 All four principal characters showed such a range of emotions and realistic pain that the audience was silently captivated throughout the show. That pain was not only evident in their voices, but as true professionals, it was consistently evident in their faces and bodies. The strong performances were rewarded in the end with a heartfelt standing ovation. The supporting performances were equally strong. Especially noteworthy were Gordon Bass as Charley, Willie’s one true friend and Bill Patton as Willie’s late brother Uncle Ben. Both brought a level of timing, presence and professionalism that further enhanced an already superior performance. Director Rusty Wilson and Scenic Designer Phil Hayes worked amazingly with the small stage to denote separate spaces and present levels to the various rooms in the house and exterior scenes. Andrew Bonniwell’s lighting design further enhanced both the set and the mood throughout the play. Firehouse Theater Project’s mission is to promote contemporary American theater. Willie Loman’s mission is to leave a legacy and be liked. Both achieved their missions in this performance. My connection to Death of a Salesman began many years ago when I was preparing audition pieces for college. I was looking for a monologue that somehow felt true to my sensibilities, and would give voice to my own feelings of an uncertain future. Enter Mr. Miller, and Biff’s monologue to Willy at the end of the play. Through Biff, Miller gave me the language to speak to my own father about feeling lost in the world, and about how difficult communication between people can sometimes be. Thanks to Mr. Miller, I went to college, and started talking with my dad. For a long time, I could only see the play from Biff’s point of view. With age and experience, however, my lens opened opened up a bit revealing to a much greater extent, the totality, and scope, of this amazing play. 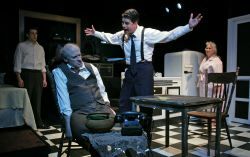 Death of a Salesman is a play for all times and all peoples because it addresses two universal themes: relationships and values. It asks the eternal questions, who we are, an what do we hold dear. The story is told through the intimate prism of a family, but also addresses both our national and global communities. Who are we? What do we hold dear? It seems to me that the answer to the second question most certainly informs the answer to the first. Currently these questions are at the center of our national dialogue. If we listen, I believe Mr. Miller has some things for us to consider. This article can be linked to as: http://showbizradio.com/go/8951.